Last Christmas, I wrote a post on new Christmas boots, both the ones I'd anticipated and the ones I received, preceded by a long preamble reaching back to my childhood. Writing the post reminded me of a long-ago pair of boots and their contribution to my attitude on money management. The story of those once-upon-a-time boots is an important corrective to any impression my earlier preamble might have given that frugality in my childhood was stinginess. (If you haven't read those earlier posts, you might not know that I'm the eldest in a family of twelve, so frugality was a daily necessity, often an art.) In fact, as much as I remember having to account for money spent as a child and teen, as much as I remember returning pop bottles for cash and berry-picking to buy a family rowboat, as much as I remember mixing up milk powder when I would have preferred "store milk," I also remember my dad saying that if there was ever anything we really, really wanted, we should tell him, because he'd try to find a way to get it for us. And I remember once that he really did. When I was 17, graduated from high school, and driving my little '67 Sunbeam Imp (bought with money I'd earned from part-time work, supplemented by a small loan I repaid my parents) back and forth to UBC, every penny counted. A scholarship paid my tuition, but there were textbooks, car maintenance, insurance, and gas, the occasional coffee or even a splurge on lunch with a friend, and occasionally a new something or other for my wardrobe. By winter, though, it was obvious I was going to need a new pair of boots, and while I'd now be all over that option, at the time I couldn't get excited about spending my hard-earned cash on something so practical. So when my parents asked what I needed/wanted for Christmas, I had a ready answer. And I knew exactly the style they should get me -- does anyone remember a period in the very early 70s when this shape of boot was everything a teen wanted? We called them mukluks although they're not really a mukluk at all. Trolling the Internet, I've found a picture of a Norwegian boot whose shape is exactly what we were all after. Some friends had ones made of (fake, I think) sealskin, but I was going to be quite content with the nylon fabric version. Of course, these were the silliest boots possible for the wet reality of West Coast winters -- about as practical as putting large sponges on one's feet. But hey, everyone was wearing them . . .
More than the boots, though, what I really, really craved was a radio for my little car. 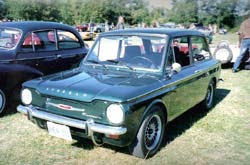 My little Imp (another one, very similar, pictured here, recently the subject of this fond article in Canadian Driver) was fun to drive, what with its Manual Choke, its rear-engine, its funny little hatch-back window (not to mention its relation to the Sunbeam Tiger or Alpine), but it didn't come equipped with radio. Boots and radio would cost about the same, but I knew my parents' Christmas budget limitations, and I knew my request had to be for one or the other. I opted for practicality, but dad knew how tough the choice was for me. Sure enough, when I opened my gift on Christmas Eve -- we always did our opening then so that Christmas morning could be saved for getting to Mass -- I resignedly but gratefully confronted the much-needed boots, exactly the pair I'd have chosen for myself. I hugged Mom and Dad thanks, then settled down to try the boots on, when Dad reached over and handed me an envelope. Inside was a note I wish I'd saved: In his inimitable print-writing, generally all capital letters, typical of his North England 1930s schooling, was an equally typical goofy rhyme confiding that he might get in trouble with my mom for breaking the budget, but that I should go to the next clue to see what I might discover. I can't remember if there were two or three more envelopes to direct me, but I know I ended up in the side garage at the back of the yard where another gift sat in the seat of my little car. I can see his grin even now, forty years later, and not simply because it's pictured in the photograph I keep at my desk. His spirit surfaces with every gift I've ever given or received, and ten years after his passing, we miss him often, but especially at Christmas. And while I respect the value of a good budget, well adhered-to (and while I have some feminist sympathies with my poor mother's role in this story), I can't help but think of the MasterCard commercial. Now it's time to share, please . . . which gifts linger in your memory? will any of this year's, given or received, join that number? Wonderful story! Have a very Happy Christmas. What a lovely Christmas story! I too had a tear or two escaping. What a fantastic story. Thank you for sharing! you must have many fond memories of your father. A beautiful act- and a beautiful story. So much more appreciated too, when a large gift is not expected or assumed. K: That's a wonderful gift, such a luxury -- the common element to my gift and yours that makes them both special, I think, is the foresight, the planning, involved. To me, that indicates being held in someone's thoughts, lovingly, for an extended, focused period and I think that spills over and suffuses the gift itself. My father's glee at having managed to surprise AND delight me is part of my pleasure at the memory so many decades later. Thanks, SL and Liz -- always happy to hear from less frequent commenters! Leslie: I really do -- as you do, of yours, I know. Duchesse: It's true that I remember many of my childhood gifts because they weren't buried in a surfeit -- not having too much did make it easier for me to really appreciate what I did have. Kath: That's the thing with a big family, isn't it, especially one so spread-out -- we get to hear new stories we'd never heard about. I knew nothing of the Garfield phone although I do remember that doll that was as big as you. . .
What a beautiful story ... I don't have anything to compare, but my father (who died almost 21 years ago) used to give me the most special things - French perfume when I was just hitting my teens, etc. He got so much pleasure from choosing and giving beautiful gifts and I like to remember that. Tiffany: I'd say your memories are comparable if they've kept you fondly thinking of your father so many years after his death. It must have been tough to lose him so young. What a beautiful story. I'm glad you posted it.